Connoisseurs of wonderful cars and superb cuisine will find a holiday in the delightful medieval town of Modena in northern Italy most rewarding. Modena and near-by Parma are the home of Italy’s greatest exports, Parma Ham, Parmesan Cheese, Balsamic vinegar and, of course, Ferrari and Maserati. Plan your next holiday to include enough time in this region to get a true taste of some of the best that Italy has to offer. Here are some of the attractions that you must include in your holiday plans. Hombre Farm – Motorvalley Panini Collection Tour. Matteo Panini is a young farmer in the region, one of many Parmesan cheese producers, who also happens to have an amazing collection of motor vehicles which have been passed down to him from his illustrious family which included his father Umberto, who together with his brothers Benito, Franco and Guiseppe, invented the famous Panini stickers. The motor collection started with tractors, which all farmers needed, and one of the exhibits is a 1934 Landini, still in perfect working order. After tractors came motorcycles, the most common mode of transport after WWII, and after that came the wonderful cars, featuring examples from Maserati that are thought to be the most important collection of these super cars in the world. In addition to Italian motor vehicles, there are also many examples from other countries such as British motorbikes from Norton, and even a Messerschmitt car and a Lotus! A visit to the Hombre farm is an excellent family day trip. First visit the dairy, where 12 wheels of Parmesan are produced daily, and then enjoy the motor museum. No culinary visit to Modena would be complete without having a meal at this wonderful restaurant, the brain-child of world-renowned chef Massimo Bottura, who grew up in Modena and developed his love of cooking by watching his mother prepare food. Massimo has come a long way since then! His food is a modern interpretation of classic Italian cuisine, but this chef, who has worked with some of the big names of the culinary world, such as Alain Ducasse and Ferran Adrio (of El Bulli) is forever pushing the boundaries. He won his first Michelin star in 2002, a second in 2006 and a third in 2011, as well as numerous other awards and distinctions. This year, 2013, La Francescana came in 3rd of the 50 best restaurants in the world. Of course you have to book well in advance, and of course it is expensive, but it is worth it! His signature dish for 2013 is called Camouflage – a hare in the woods; it is made up of a thin layer of foie gras decorated with various powders composed of hare blood, chestnut and several herbs - perhaps this dish is not for everyone, but it is an example of the chefs’ innovation. Of course, there are more conventional dishes to suit all palates. 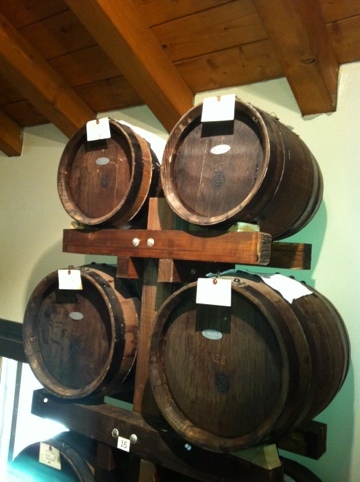 Genuine Balsamic Vinegar has been produced in Modena for centuries, and is a unique artisanal product, completely unlike regular vinegar. The basic ingredient is grape Must (juice) from predominantly Trebbiano grapes (sometimes with the addition of Lambrusco grapes). The must is simmered (never boiled!) for a lengthy period to reduce and concentrate the liquid. This liquid is then allowed to ferment and mature for a minimum of 12 years in the case on a “true” Balsamic. This wonderful product, known as Black Gold, can sometimes be matured as long as 25 years and a new batch is traditionally started to mark the birth of a baby girl, and treasured to become a part of her dowry! Balsamic vinegar should be used sparingly – just a drop or two to enhance a sliver of Parmesan or a slice of Parma Ham. Make sure to visit one of the Balsamic producers of Modena during your visit to learn the process of the production, learn how to use it, taste the wonderful nectar and, of course, buy some to take home with you to remind you of Modena. see the Pope and receiving the imperial coronation. about the qualities of this product. the past as a drug and an elisir of long life. cauldron directly on the fire, but at low heat. In this way. The liquid part slowly disappear and the sugars can concentrate. fermentation that get converted the sugar into alcohol. particular phase because it was considered too dangerous. Our farm stands inside the vineyards, our oxygen, our family's oxygen. satisfaction. Wines absolutely need a good years. long time automatically loses a but of its vintage. barrels, into the barriques. This is the real secret. time and the humid heat during the summer are really crucial. litres, 40 litres, 30 litres, 20 and 15 litres. All made from different woods. personal “batteria” is personally considered the best one. 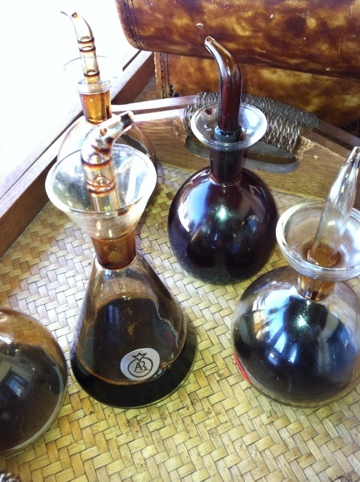 traditional balsamic vinegar was kept only for family use. only the children, but all the persons the we meet daily. time to change you habits and to enjoy the taste of a unique essence.